H.H. General Sheikh Mohammed bin Zayed Al Nahyan(second from right), launches a new media zone in Abu Dhabi with H.H Sheikh Abdullah Bin Zayed Foreign Minister(far right) and others. 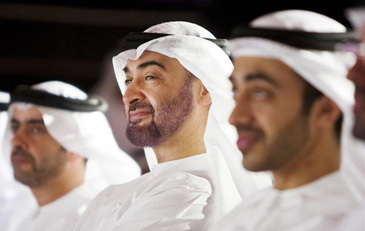 ABU DHABI(WAM)- Abu Dhabi Crown Prince and Deputy Supreme Commander of the UAE Armed Forces, H.H. General Sheikh Mohammed bin Zayed Al Nahyan, launched a new media zone in Abu Dhabi to be known as "TwoFour 54" on Oct. 12.. The name reflects Abu Dhabi's geographical location on the world map - lying in-between 24 degree north of the Equator and 54 degree east of the Greenwich Meridian lines - which makes the UAE capital a centre of excellence in Arab content creativity at international level. The new initiative provides opportunity for the setting up of a new industry in the region by providing a fully-equipped supportive environment capable of gathering under one roof local, regional and international companies operating in various media sectors, including film industry, broadcasting, publishing, digital technologies and music. The launch of "TwoFour 45" was attended by a host of top officials including H.H Sheikh Abdullah Bin Zayed Foreign Minister, H.H Sheikh Saif Bin Zayed Al Nahyan, Interior Minister, H.H Sheikh Dhabi Bin Zayed Al Nahyan, Chairman of Abu Dhabi Water and Electricity Authority (ADWEA), H.H Sheikh Mohammed Bin Khalifa Al Nahyan, Chairman of Abu Dhabi Finance Department, Sheikh Sultan Bin Tahnoun Al Nahyan, Chairman of Abu Dhabi Tourism Authority, Mohammed Ahmed Al Bawardi, Secretary general of the Abu Dhabi Executive Council, Khaldoun Khalifa Al Mubarak,. Chairman of the Executive Affairs Authority and Chairman of Abu Dhabi's new media zone "TwoFour 54": Following is the text of the speech delivered by Khaldoun Khalifa Al Mubarak: "Your Highness, Excellencies, ladies and gentlemen. It is also an important step in the ongoing diversification of the Emirate's economy. More importantly, we expect that over time the impact of today's initiative will be felt far beyond the Emirate of Abu Dhabi and the UAE, and will extend throughout the region and across the world. At the core of today's announcement is the establishment of a unique centre of excellence for the creation of media content, and the development and training of world-class media professionals, right here in the Emirate of Abu Dhabi. We are establishing new educational and training opportunities specializing in media and media industry skills, and are creating a space dedicated to truly creative enterprises. This is an unprecedented initiative, which in the form being unveiled today, does not exist elsewhere in the world. However, from the perspective of the Government, this is not just about developing new media content. Rather, this is a significant cultural initiative. As a result, stories will be increasingly told by writers and filmmakers from the region. Ultimately, we believe that this initiative will see home-grown content being made much more widely available to the rest of the world. Today's announcement is also good news for the development of human capital and economic opportunity. The ambition is that this initiative will provide new educational and career opportunities and contribute to a thriving media sector in the region. Abu Dhabi has a proud record of identifying opportunities capable of producing mutual benefits for the Emirate, its partners, and others. This initiative is another example of this approach being put into action, and its success will benefit the entire media environment: both locally, and globally. As a result of today's announcement our hope is that international audiences will have access to more diverse - and indeed in part, more authentic - media content from the region, at world-class standards of production and performance. Closer to home, the aim is to create outcomes for Abu Dhabi and the UAE that will see new skills, graduates and jobs in the local media industry. Combined with education, no sector contributes more to the development of a broader view of the world than the media. And similarly, no other sector enables the rest of the world to take a broader view of the region in which we live. Through this initiative, the Emirate of Abu Dhabi has the opportunity to make a significant contribution to the global media environment, and to become the source of some of the most innovative and far-?reaching media content being created across the world. In that way, the Emirate of Abu Dhabi and the initiative we announce today will both contribute to a brighter future for the media industry, and a range of new educational and career opportunities for media professionals in the region, and young people with an interest in the sector." Thank you."